Inspired by the minimalist design movement, 400 Wellington is a beautiful yet pragmatic condo located at the heart of the bustling Financial District. The 12-storey building features 102 suites offering 1 to 2 bedrooms with or without dens. Exposed concrete lends the building a warehouse-like ambience and faithfully represents the neighbourhood’s historic charm. 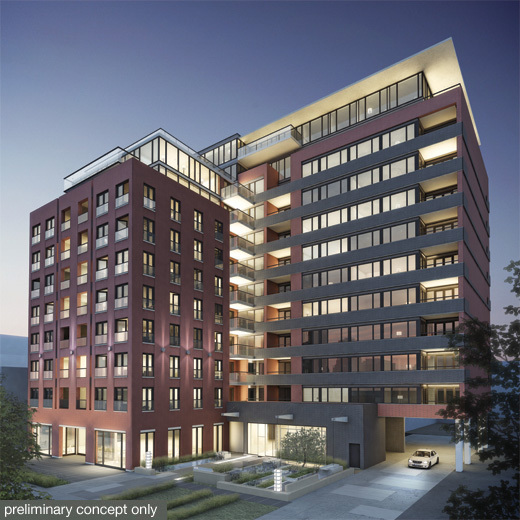 Orchestrated by the well-known Sorbara Developments and SMV Architects, the building features well-designed details that add to its aesthetic such as the rooftop structure of warmly-lit glass. Conveniently located near the Spadina streetcar, amid ultra-chic restaurants such as Marben, Le Select Bistro, and Bar Wellington, 400 Wellington is the place to be! Living here places you within walking distance of the Theatre District, numerous attractions like the Roger’s Centre, and even the gorgeous Toronto waterfront. Live in convenient luxury at 400 Wellington.